At the end of June I was laid off from a job that while I didn’t absolutely hate it there were definitely some moments that I really wish I didn’t have to be there. There have only been two times in my life that I have been unemployed and I accepted my previous position out of panic really. I had been without work for nearly three months and after some initial excitement with interviews and meeting with placement agencies my phone had stopped ringing. So when I was offered a position during a second interview I jumped at the chance to start working again without really taking time to consider what I was getting into. It also meant that I had to turn down the other jobs I was interviewing for. Working at this company wasn’t particularly hard it was more of a challenge. A lot of the people I worked with were fresh out of college and this was their first job. I remember being that age and having the same set of ideals but luckily for me I had a solid corporate structure that helped whip me into a really great employee. This being a start up it didn’t have any of that structure. Sure there were some HR people there, some management and an attempt to set up an Executive team but nothing was right. It was like going to work in a middle school cafeteria. There were cliques, yelling, horseplay and not very much work getting done. Sure when it had to happen there would be a scramble to make it happen much like the last five minutes of the lunch period and you realize you haven’t finished your math homework. After finding out how imbalanced the staff pay was I began to realize why this environment took shape. But I’m not sure a bigger paycheck would have helped considering that people were working off of plastic folding tables. The morning I was told I was being laid off I was initially relieved. My position there required me to do some things I was highly uncomfortable with, no one should have to know how to forge their bosses signatures or take their continuing legal education classes for them. When I was asked to do these things I was riddled with guilt and a sense of shame and knowing I had to keep doing these things until I could find another place. I had started applying to new jobs and had a few interviews but nothing had been offered yet. I was part of a large group of staff laid off that day and was the only one asked to finish out the week which made it very awkward to be there. I didn’t tell anyone it was my last week but somehow people found out and it was difficult to have everyone come up to your desk and just kind of stare at you not knowing what to say or avoid making eye contact with you in the halls. I didn’t have an answer for them when they asked what was I going to do, I didn’t know really. I knew I wanted to find something else right away but I had a trip to the UK I had booked for months before and I knew I still wanted to go. So off to the UK I went and had a great time but all the while knowing when I came back it was time to get serious and really find a job as soon as possible. I’ve been back for two months now and have had a few interviews and an offer from a place that really just wasn’t the right fit. I know it’s just a matter of time until I find a place where I’ll be happy, I just hope its soon. The sound of my neighborhood during the day is driving me absolutely mad. The gardening crews that seem to show up every few hours, the school up the street, the aforementioned squabbles and today’s surprise of a jackhammer. I try to leave the house and go to the park or for a ride on my Vespa when it gets really bad but what I really want is to have a place to go every day and not have to worry about when the jackhammering is going to stop. 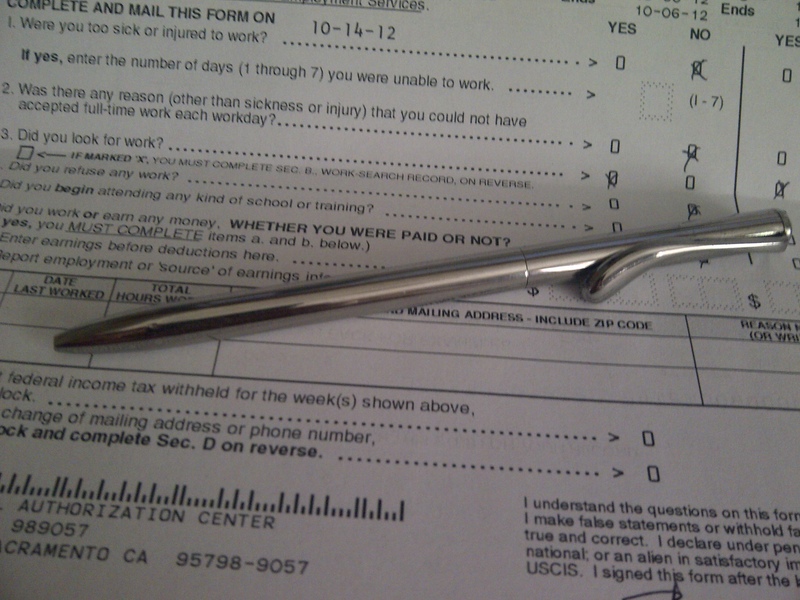 But for now I’ll fill out this unemployment claim every two weeks using a sterling silver Tiffany pen because why not?